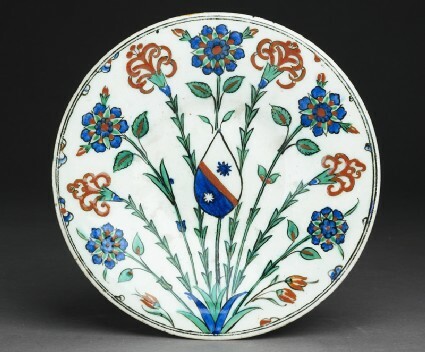 Although the colours and designs of Iznik pottery have held a special attraction for the European eye for the last century and a half, documented evidence of their interest in the sixteenth century is surprisingly scanty. The only literary evidence seems to be a suggestion by the Habsburg Ambassador in Istanbul in 1577 that the Bishop of Salzburg might wish to order some Iznik tiles, but no such order is known to have been placed. All the more important, therefore, is the set of dishes emblazoned with a European coat-of arms. Of this set, ten pieces are known to survive, and two are in the Ashmolean [EAX.3268 & WA1888.CDEF.C324]. Whose coat-of-arms it actually is, is not absolutely certain. 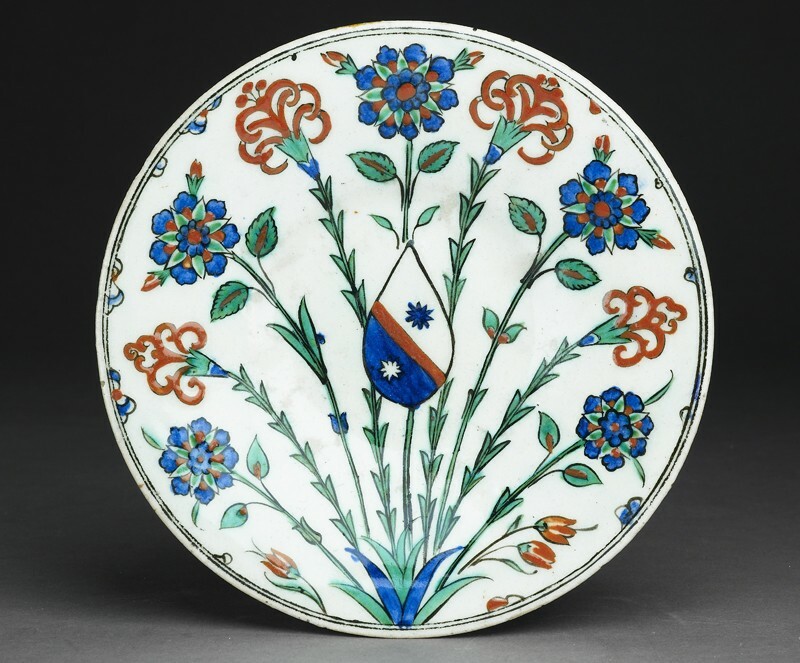 The most likely candidate, however, seems to be a member of the Spingarolli de Dessa family of Dalmatia (northern Yugoslavia), whose blazon fits that on the Iznik dishes most precisely. The Dalmatian city of Ragusa (modern Dubrovnik) had a flourishing trade with the Levant in the fifteenth and sixteenth centuries, and an order for Iznik dishes from one of its merchants would be perfectly appropriate. In the twentieth century, components of a dinner service are expected to be in an identical pattern. It is interesting to see that the Iznik dishes, though they are all decorated with a spray of flowers, bear different floral arrangements. For example, whereas in these two examples the blazon is set against the central flower stems, on some pieces it is framed by them, making a quite different visual impact. N. Atasoy and J. Raby, Iznik. 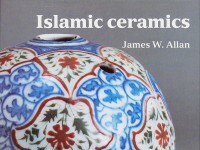 The Pottery of Ottoman Turkey (London 1989) p.264-6.